I love sketches. It really helps with the inspiration. I am using Clean and Simple's sketch for my card today. I used the script embossing folder to emboss the kraft cardstock. 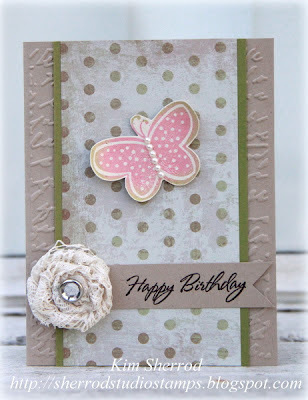 I stamped the butterfly by using the rock and roll technique, cut out the shape, rolled the wings up with a pencil, added some pearls and used 3-d tape to pop it onto the center panel. The rose is made using lace ribbon and I added a rhinestone in the center. Beautiful creation. Thanks for joining us at Crafts4Eternity. How sweet!! Thanks for playing and sharing this with us at the Paper Players this week!